Wow, what a story. It is one thing for a person to build a boat and sail around their local waters. But to sail across the ocean and back. I've had a reply suggesting that Erik the Red went back to sea following her time at Exeter – and was eventually wrecked. Can anyone confirm the story please? Also, what happened to Donald Ridler? He must be quite an fella! 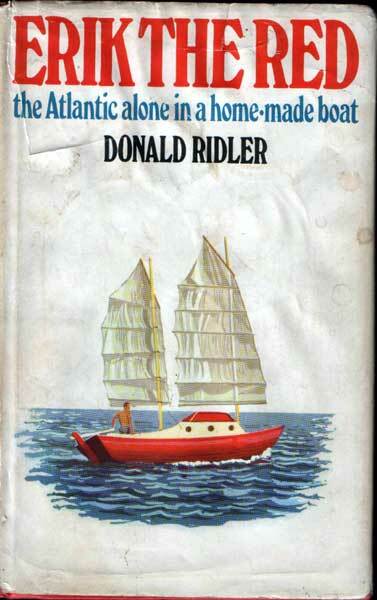 According to Betty Hill, in her book "Voyaging on a Small Income" Donald Ridler "set off round the world" and Eric the Red was wrecked on the Cape Verde islands, just short of him completing his circumnavigation. Has anyone been able to track Erik The Red down ? I cannot trace the website, do you have the url address? As far as I know the collection at Exeter all went to a man named Andrew Thornhill, who subsequently opened a Museum in Eyemouth, Scotland, called SISCAE, can't remember what the initials stand for. They have a web site which should give you a contact there. I am trying to etsablish the wherabouts of "Erik the Red", the boat that Donald Ridler built and sailed to the Carribbean abd back, during the '70's. I understand that it had previously been on display at the Exeter Maritime Museum. Please advise if you have any information that could assist my enquiries. I remember seeing Eric the Red at the Exeter Maritime Museum many years ago. It was a pivotal moment for me, as a young man full of wanderlust dreaming about far horizons. It must have been fate that I was kayaking across Darwin harbour in Australia's Northern Territory when I saw Erik the Red moored off a beach lined with coconut trees. Donald was sitting in the cockpit reading. A very long beard, dark tan wearing just a pair of old shorts. He was amazed to hear that I had seen his boat in England and told me about his journey across the Pacific using rudimentary Polynesian navigation with a 'chart' made out of sticks stones and string. He slept on a hammock and seemed to have only a few possessions. I spent about an hour or so with him and he told me he was leaving for Bali the next day. I don't recall the year this happened but the last time I was in Darwin was 1995 and this meeting was quite a long time before that. Donald got Eric the Red back from the museum, fitted an aft cabin to it and set off around the world, I am not sure what year he passed through Darwin but Eric was wrecked in the Cape Verde Islands in 1977, just a few hundred miles short of circumnavigating the world. He had no engine, and drifted onto the rocks while becalmed and in the grip of a fierce current. Donald survived the shipwreck but I do not know what became of him. Graham Cox, solo of junk rigged sloop, Arion, Cairns, Australia January 2013. Eric the red was no doubt the vessel I saw in Cape Town yacht basin about 1977. This sighting was probably one indelibly etched in my memory and led to the conversion of an old teak lifeboat/sloepen by myself not many years later. This vessel was also shipwrecked on rocks due to the lack of motor power. I just came across this post while wandering the web. As the nephew of Donald Ridler, I have to say that he died this past January. He died estranged from his surviving siblings and, therefore, the rest of the extended family. It’s a complicated story, but my feeling is that he never quite recovered from the crushing disappointment of that doomed round-the-world journey back in 1977. It pleases me all the same to find this little string of messages from people who clearly recognize Donald’s extraordinary accomplishment all those years ago – thank you. Thanks for letting us know Crispin. I’m very sorry to hear that his life seems to have been less than happy – reading around the subject over the years it does seem that long voyages can have a profound effect on people. Even a near circumnavigation in a home-made boat is surely a mighty achievement. Gavin, hello. Thank you for your response – much appreciated. Such was the estrangement between Donald and his siblings (my mother and surviving uncle) that I can imagine that no obit was written or published. Sad but true. For my part, I just re-read “Erik the Red” this weekend and was certainly reminded of his remarkable story and achievement. Kind regards. That’s so sad. I obviously didn’t know the man, but his extraordinary boatbuilding, voyages and book have made his sailing an inspiration to many. I hope his achievements are not forgotten. Hi Gavin and Crispin. Very sad to read about Donald Ridler’s death and his unhappy life after losing Erik the Red in the Cape Verde Islands so close to the end of his circumnavigation. It did not in any way diminish his achievement. If he’d written a book about the circumnavigation he’d have been able to get another boat or do whatever he preferred, and we’d also have benefited from being able to share that wonderful story. I am a solo sailor and sail a junk rigged yacht, partially because of his inspiration. I am also the author of the Hall of Fame series for the Junk Rig Association and wrote an article about Donald and Erik the Red which can be viewed on the public pages of the Junk Rig Association’s website. I’ll email a photo of my boat, Arion, to Gavin. It is a Tom Thumb 24 and i am currently in Townsville in North Queensland, inside the Great Barrier Reefs of Australia. lives on in my head hence I just randomly Googled it. One thing is for certain, the attitude of the book and its author inspires me to this day with a ‘I can do that’ outlook on life in whatever I decide to take up.